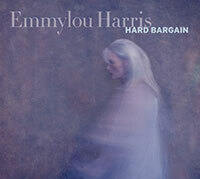 By now you’ve listened to Emmylou Harris‘ Hard Bargain. Thanks to those stations that have charted it and helped it break the Top 50 on the CMJ Top 200 charts! If you havent’ received it, let us know and we’ll be sure to send you a copy. The album solidifies Emmylou’s position as “Queen of Country Rock.” David Letterman recognized that when he introduced her as “an icon, one of the greats,” before her performance of “Six White Cadillacs” on the Late Show – to watch the performance click here. Emmylou Harris will be performing in North America throughout the Summer, for dates click here.